You’ll need to stand out from a sea of college hopefuls hungry for their first job. No pressure, right? This is how you can own the stage. You may be thinking about skipping your school’s spring career fair. Don’t. It could be your ticket to getting a job. “Job fairs enable college students to meet face to face with dozens of employers all in one day,” says Harry Dahlstrom, author of Turn a Job Fair Into a Job Offer. But a lot of seniors opt out, and even those who do show up often arrive unprepared. “Students don’t know what to expect, so they freeze up when talking to recruiters and wind up feeling disappointed,” laments Dahlstrom. Your goal is to leave with job interviews lined up. The tricky part, though, is figuring out how to make a killer first impression—often in less than five minutes. It’s no easy feat, but we’ve got you covered with this career fair playbook. Don’t just roll up to the fair without doing some legwork first. Talk to your career center to find out what companies will be there. Often, this information is posted somewhere on your school’s website. Some schools let students register for the event, but not everyone signs up. This can be a big missed opportunity since recruiters typically have access to the signup list and may pre-schedule meetings with attendees, says Barbara Hewitt, senior associate director of career services at the University of Pennsylvania. To make prep work manageable, pick three to five employers you want to focus on and do your homework. Read up on company news, follow the organizations on social media, and see whether they’ve posted any entry-level jobs online. 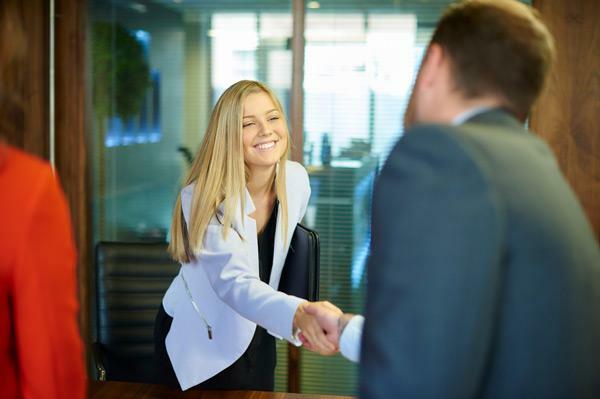 “You can find out what skills they’re looking for by reading the job description and then talk about how you’ve developed them,” says University of Virginia career counselor Kelly Kennedy. Meeting with multiple recruiters back to back can be intimidating—and selling yourself to someone may not feel natural. (Marketing majors have a nice advantage.) Therefore, practice how you’ll introduce yourself with a friend the morning of the event, since the start of the conversation sets the tone, says Hewitt. Be clear and succinct: “Tell the person your name, what you’re studying, and why you’re interested in their firm,” Hewitt advises. If you’re still a bundle of nerves when you arrive at the fair, give yourself a warm-up by starting with a company that you aren’t interested in to “shake off the jitters,” says Dahlstrom. Kennedy recommends arriving at the beginning of the event, when it’s often less crowded. Also, “when it’s early in the day, [the recruiters] aren’t burnt out yet from talking to tons of students,” she says. Even better (if your career center lets you): Volunteer to help set up the fair so that you can get access to recruiters ahead of time, says Dahlstrom. Bring a folder with at least 10 copies of your resume. Trust us, you’ll be glad you brought that many. You might come across a desirable recruiter that didn’t register for the event, for example. Depending on your industry, you’ll want to have a portfolio of your work with you. “If you’re studying architecture or graphic design, carry samples of your work that you can leave with recruiters,” says Tony Beshara, president of Dallas-based job placement firm Babich and Associates. Gunning for one or two companies in particular? Consider writing a one-page letter explaining why you’re a good fit for the company, suggests Hewitt. “You’re probably the only student who will do it, and it shows you really know the company,” she says. Even if you get there early, you might still need to wait in line to talk to some recruiters. Rather than playing Candy Crush, use your smartphone to look at what companies have recently posted on social media. “A fresh tweet or Facebook post can make for a great talking point,” says Kennedy. You can also spend time reviewing job postings that you plan to mention. In addition, don’t be afraid to eavesdrop, says Dahlstrom. Translation: Listen to what questions recruiters are asking the students ahead of you. Take notes during the conversation so that you have talking points you can use to send a meaningful follow-up email. To close the chat, slip the person your resume and find out the next step in the recruiting process. (“This sounds like a great opportunity. What’s the best way for me to move forward?”) Then thank the recruiter for their time and take their business card. One more thing: You’re there to meet potential employers—not leave with party favors, says Hewitt—don’t take any company merchandise with you. Plus, carrying around an “I Love Target” T-shirt may not go over well with the recruiters at the Walmart booth.